Our ambient temperature usually hits triple digits in late May and stays that way through mid-September. That's when electrical costs skyrocket. 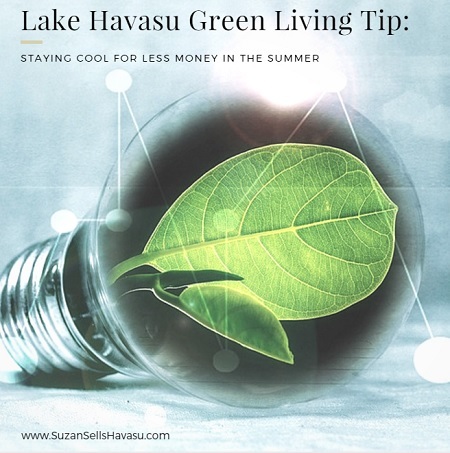 An important Lake Havasu green living tip involves energy costs. What if I told you that you could stay cool in the summer without breaking the bank? It can be done. If you don't have one, invest in one. They range anywhere from $40 to $250 and can be found at your local home improvement store, Wal-Mart or online. This helps you regulate your air conditioner when you're not at home. 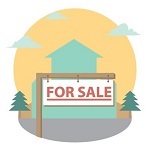 It takes more energy to cool down a Lake Havasu home that had its air conditioning turned off all day than it does to maintain it at a slightly higher temperature throughout the day. Program it to stay at a higher temp while you and your family are gone. Then, about 30 minutes before the first person arrives back, set it to start cooling off to a lower temperature. This translates to a 10% savings or more per year on energy costs. Keep blinds and curtains closed during the daytime. This helps lower temperatures inside your Lake Havasu home. Also, awnings help reduce the sun's glare through your windows. High reflectivity window film can help reduce the heat inside your home as well. However, they tend to reduce your ability to see outside your windows and reduce light inside. You tend to see ceiling fans in most areas of a Lake Havasu home. This helps circulate the air, making it feel cooler inside. While some can be costly, you don't have to spend a fortune to make a big difference. And they are a lot less taxing on energy costs than a central air system. Instead of heating up the house in the already hot summer days, opt to grill on the barbecue instead. Southern Living offers 54 no-cook recipes that are perfect for triple digit evenings. Get your creative juices flowing so you can lessen the electrical juices flowing throughout your home in the summer time.